Due to one of our late Friday games last year, we desperately searched for restaurants open real late (or real early). It was 1:15am and we hadn't even left the rink yet. There are not a whole lot of really good places to eat that are open until 4:00am (or 24 hours). 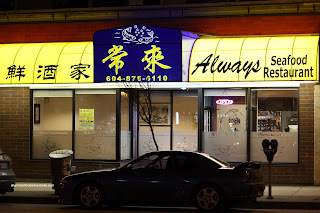 Therefore, it was out of necessity we headed over to Always Seafood Restaurant. 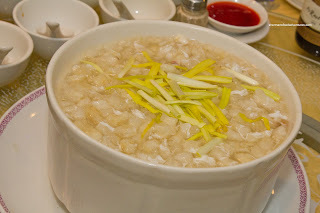 As such, we ended up trying their "da-lang" menu which features smaller dishes usually served with plain congee. Although the food wasn't horrible, it wasn't great either being really greasy. Hence, we have not made a revisit since. However, when I met up with Stephanie Yuen at C Restaurant, she insisted that the food we ate was not representative of the chef. In fact, she invited me to a wine tasting/dinner at Always. Since I respect her opinion, especially when it comes to Chinese food, I accepted. Alvin, who was with us at C Restaurant, was also present at our dinner at Always. Man, I have major camera/lens envy when he is around. I gotta get myself a better lens! 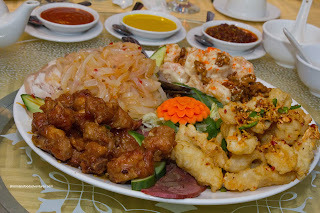 We started the meal with an Appetizer Platter consisting of 5-Spice Beef Shank, Honey Garlic Spareribs, Marinated Jellyfish, Hone y Walnut Prawns, Jellied Pork Hock and Fried Squid. This was a great start with perfectly textured jellyfish which was in large strands (I hate little bits which are hard to pick up) and seasoned properly. There was good hits of sesame oil, white pepper, soy and chili flakes. The honey walnut prawns were very sweet and I would've liked more snap. The walnuts were crunchy with a candied exterior. Crispy on the outside and tender on the inside (with some chew still), the fried squid was also spiced nicely with wok salt, chilies and fried garlic. The 5-spice beef shank was somewhat on the chewier side, yet n ot overly so and exhibited plenty of flavour. Lastly, the pork hock (underneath everything) had the requisite jellied texture. 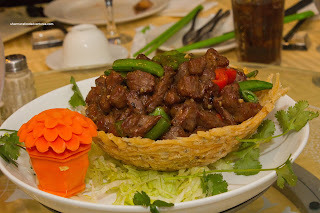 Next up was an interesting dish being the Sauteed Beef Tenderloin in Silver Fish Bird's Nest. Okay, first of all, let me get this straight. These were not the same silver fish you find crawling on your kitchen floor. Rather, they are little fish that are battered, fried and usually served with plain congee for late night eats. In this case, they used the fried silver fish as the ingredient for the "bird's nest" instead of potato or taro. This was both an interesting and tasty twist to this dish. Unfortunately, the beef tenderloin was far from tender. It needed more tenderization and/or less cooking. Next we had the Wok-Fried Fish Filet with decorative carrots slices, Shanghainese bak choy, scallops, straw mushrooms, flowering chives and julienned egg. This was a pleasant dish consisting of moist chili-spiced fish filets, perfectly cooked scallops and crisp veggies with a consume glaze on top. 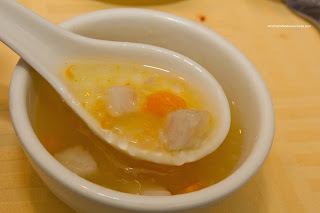 After these "appetizers", we moved onto the Traditional Fish Maw Soup with cr ab and egg swirl. I really liked this since it was silky while not being too thick and there was a balance of flavours. 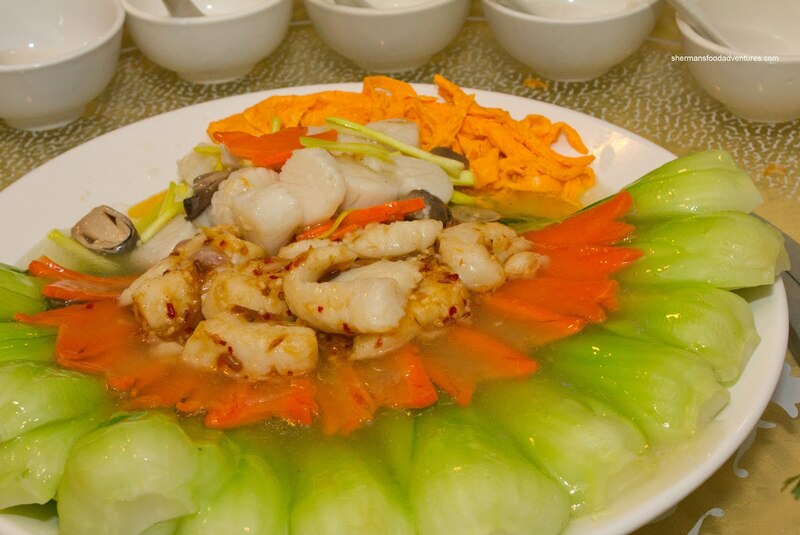 The fish maw prepared nicely where it was soft without completely melting into the broth. 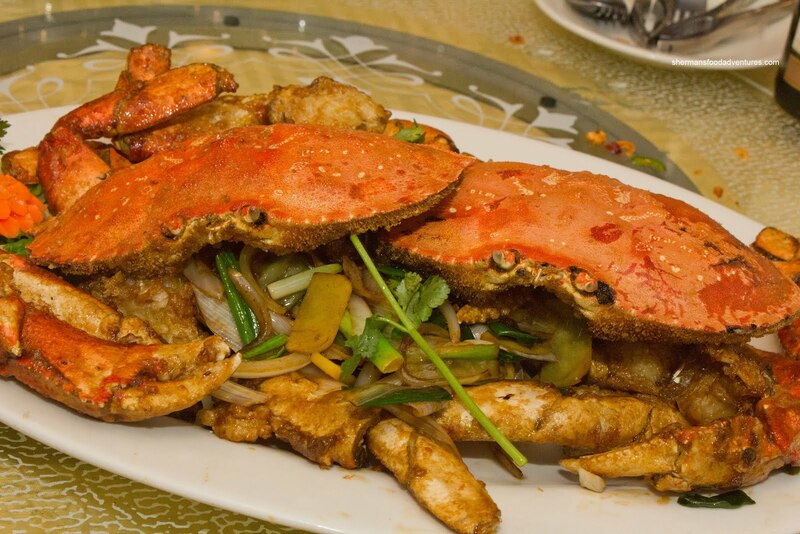 With an intoxicating aroma, the Crabs Sauteed in Chef's Special Sauce was presented at our table. We tried to figure out what was in this special sauce since it was tasty and slightly different than the typical ginger and onion flavour. We soon found out it was the use of king onion which has a much more pronounced "spicy" flavour. The use of 2 types of soy also added to the depth of flavour. As for the crab itself, they were meaty and fried perfectly where the meat was fluffy and moist. Moving along, we had the Double Cooked Goose presented in a "garden" of perfectly cooked and vibrant broccoli florets. This particular goose was first wok seared, then braised topped with a combination of bean sauces. I found the meat to be tender while still retaining quite a bit of texture. There was a mild amount of good gaminess which added to the flavour. The sauce was balanced and silky. Then the much anticipated Lobster Roll with king sauce arrived. S tarting with the positives, the sauce was really good. 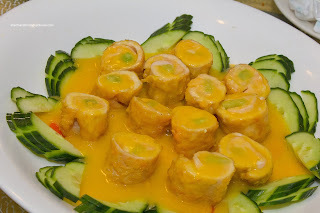 It was a combination of butter and salted egg yolk. If you are familiar with salted duck egg yolk, the flavour is unmistakable. I liked how this was manipulated to form a silky sauce which was actually not salty, rather it was quite mild. As for the roll itself, it consisted of shrimp mousse, chicken and lobster. Honestly, I couldn't taste the lobster nor experience the texture of lobster. It was dry and mealy. It was disappointing. At least I could dip the crunchy cucumbers into the sauce. After the forgettable lobster roll, we were presented with the Deep Fried Pipa Tofu in hot & sour sauce. My initial thoughts were, "a red sweet & sour sauce... really?". Oh how wrong was I! This sauce was fantastic. Imagine a really good sweet and sour sauce spiked with red hot chilies and you got yourself flavours that rocked. 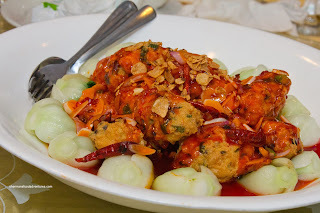 Add in the wonder texture of the pipa tofu, which is essentially a reconstructed fried ball of soft tofu with Chinese sausage, cilantro, shiitake and dried shrimp, you have a textural and flavour delight. Toss in some fried garlic chips and what we had here was the best dish of the night - hands down. 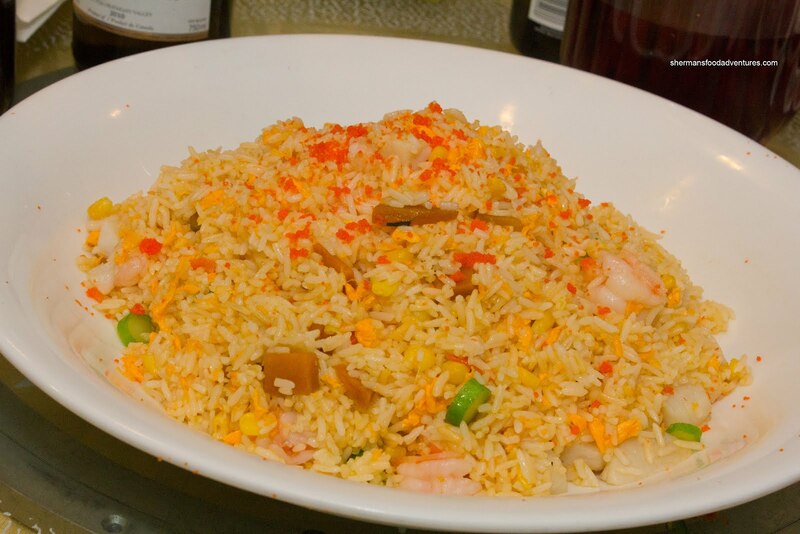 Our last s avoury dish was the typical filler item being the Gold & Silver Fried Rice with seafood, corn and golden squash. There was plenty of seafood which made the rice "meaningful" while the crunch from the corn and gai lan stalks added texture. I wasn't a huge fan of the squash as it detracted from the rice since it was dense and heavy. The rice itself was chewy and not greasy. After this came the desserts starting with the Golden Squash with Sweet Walnut. Apparently, this dessert was mentioned in Conde Nast or something like that. Whatever the case, it is a signature dish of sorts here and I can honestly say it was pretty good. 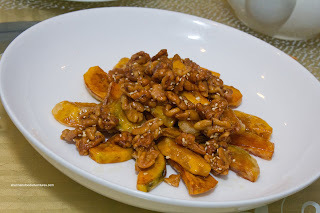 The fried squash and walnuts were lightly candied and it wasn't as heavy as I would've thought. However, I don't think I could've eaten more than my one piece of each though. Lastly, we were presented with the Diced Yam in Coconut Soup. Rather than coconut milk, this was a coconut broth (I think, didn't really taste any coconut) with yam, taro and tapioca pearls. We were indifferent about this one. Probably something to do with a bias towards sweet soups. 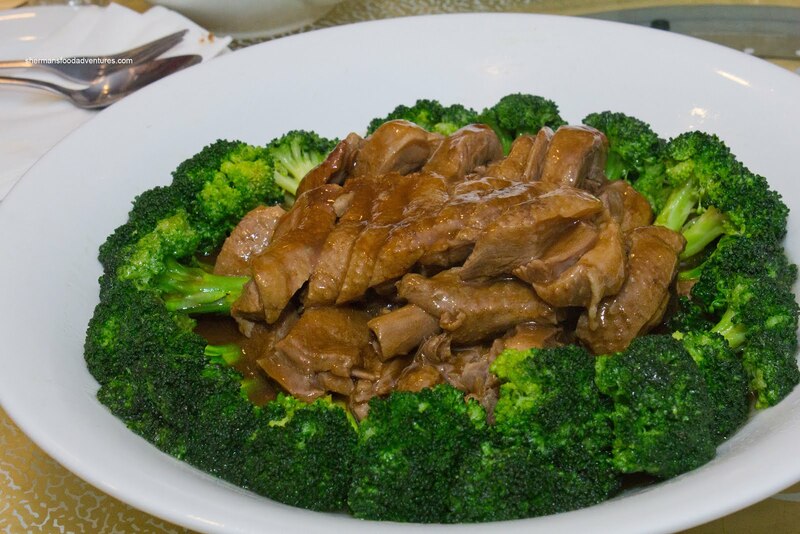 However, this meal proved that th e Executive Chef, Gordon Chan, is capable of creating delicacies that are not often found in a smaller Chinese restaurant. Sure, not everything was great, but when they were, it definitely exemplified his skill and creativity. Hence, my da lang experience was not really indicative of what you can get here during dinner hours. @LR LOL... Yes, that would be awesome!